In March 2017, the Guilford Courthouse National Military Park celebrated its centennial, as the first Revolutionary War battlefield preserved by Congress. The site commemorates the Battle of Guilford Courthouse, which took place near what is now Greensboro, North Carolina on May 15, 1781; the name “Guilford Courthouse” comes from a structure that stood on the site during the time of the battle. The Battlefield Visitor Center features an introductory film and a museum of artifacts; many are viewable in this online exhibition. 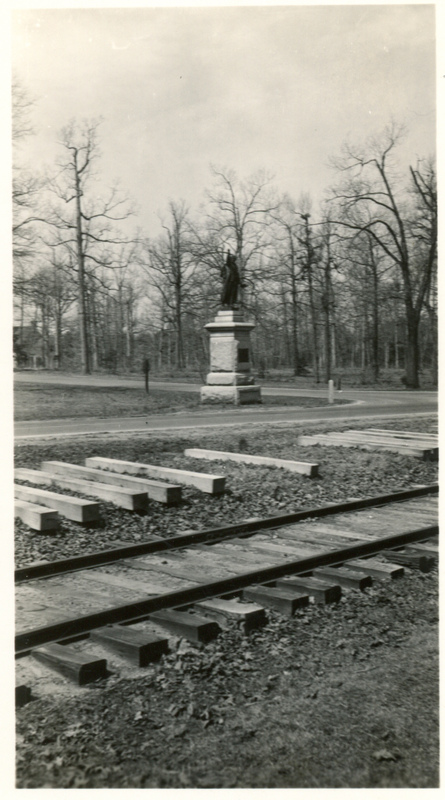 The Guilford Battleground Company was incorporated in 1887, and the site’s first monument was erected that same year. Today, 24 monuments spread out over a 2.5 mile long route through the park honor soldiers and leaders in the battle, including an impressive statue of Nathanael Greene on horseback (Greensboro itself is named for General Greene). But one of the monuments honors three individuals who, as the park’s signage says, “had no direct ties to the battle”: William Hooper, John Penn, and Joseph Hewes. In 1894, the Guilford Battleground Company sought to re-inter the remains of North Carolina’s signers of the Declaration of Independence on the site of the battlefield. Joseph Hewes died in 1779 and was buried at Christ Church Burial Ground in Philadelphia, though the exact site of his remains had been lost over the years. John Penn died in 1788 and was buried on his estate near Island Creek in Granville County, North Carolina. William Hooper died in 1790 and was buried in a churchyard in Hillsborough, North Carolina. Ultimately, the Company was able to secure the remains of Penn and Hooper, though some argue that the majority of Hooper's remains are still at his original gravesite. The remains were reburied on the battlefield site, and a monument to all three signers was designed. The Signers Monument, also known as the Hooper Monument or the Founders Monument, is located to the southwest of the Nathanael Greene monument, and is stop #8 on a tour of the Guilford Courthouse National Military Park. The 18 foot high monument faces north — perhaps recalling the signers’ role in Philadelphia — and is a bronze statue of a man (possibly modeled on Hooper) raising his right hand and holding a document in his left hand, set atop a granite base. The Signers Monument was dedicated on July 3, 1897, four years after Hooper and Penn’s remains were reinterred at the same location. In the 1970s, the monument and remains were moved from their original location because it caused a blind spot for drivers. This image from the late 1890s shows the monument in its original location (Image Credit: Documenting the American South). This plaque on the Signers Monument quotes John Adams’s diary from October 10, 1774, during the First Continental Congress: "There is so much Wit, Sense, Learning, Acuteness, Subtilty, Eloquence, &c. among fifty Gentlemen, each of whom has been habituated to lead and guide his own Province, that an immensity of Time, is spent unnecessarily. Johnson of Maryland has a clear and a cool Head, an extensive Knowledge of Trade, as well as Law. He is a deliberating Man, but not a shining orator—His Passions and Imagination dont appear enough for an orator. His Reason and Penetration appear, but not his Rhetoric. Galloway, Duane, and Johnson, are sensible and learned but cold Speakers. Lee, Henry, and Hooper [are] the orators. Paca is a deliberator too. Chase speaks warmly. Mifflin is a sprightly and spirited Speaker. John Rutledge dont exceed in Learning or oratory, tho he is a rapid Speaker. Young Edward Rutledge is young, and zealous—a little unsteady, and injudicious, but very unnatural and affected as a Speaker. Dyer and Sherman speak often and long, but very heavily and clumsily." Hooper and Penn weren't the only individuals to have their remains reinterred on the site of the Guilford Courthouse battlefield. Jesse Franklin (1760-1823), a Major in the Revolutionary War who later served as a senator and as governor, is also buried in the park. Nathanael Greene's remains were also reinterred near the turn of the century — just not at Guilford Courthouse; his grave is in Johnson Square in Savannah, Georgia. Hours: Daily, 8:30 am - 5:00 pm; Tour road open to vehicles 8:30 am - 5:00 pm. Closed Thanksgiving Day, Christmas Day, New Years Day.